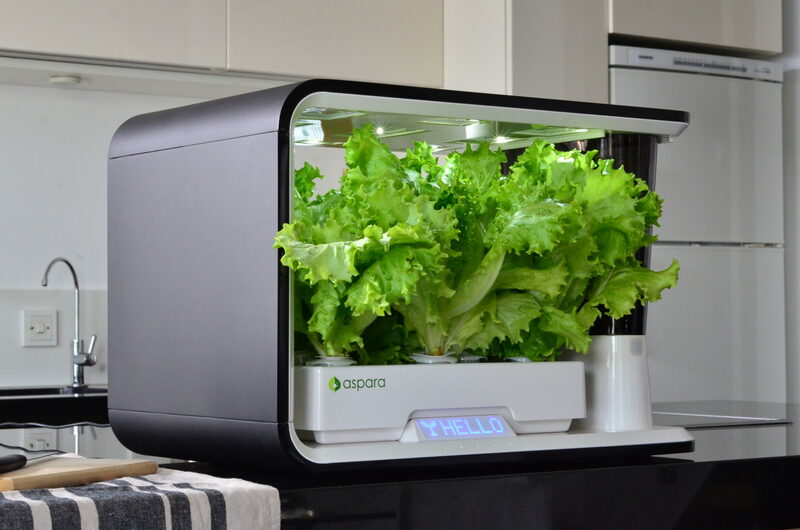 aspara™ is a hydroponic smart grower that helps you grow fresh and healthy-to-eat vegetables and herbs right on your kitchen countertop. 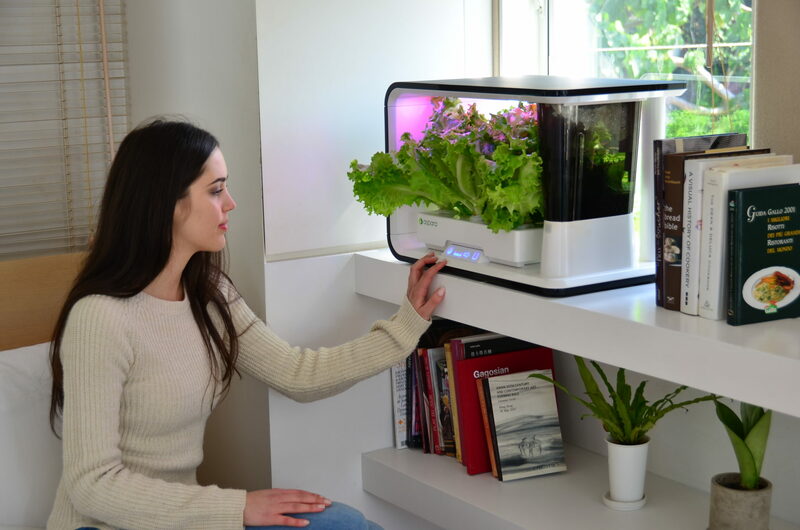 Using a combination of LED grow lights, an automatic watering system and advanced sensors, aspara™ is a connected control system for your indoor garden that does the growing for you. 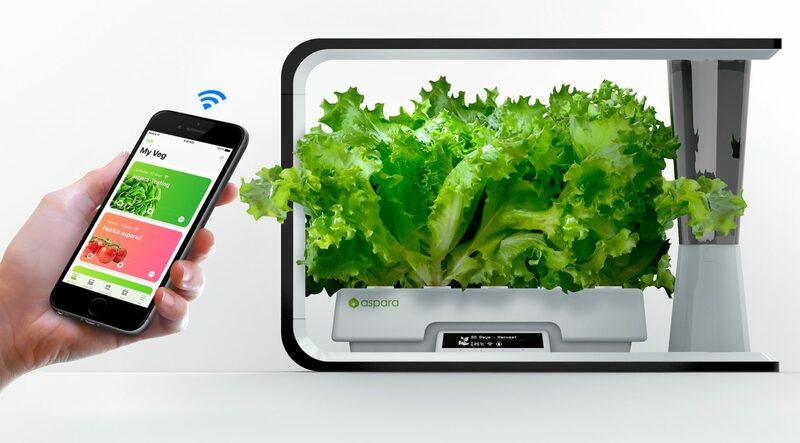 The aspara™ mobile app will extend the growing experience from individual to family, and also to the community, making growing healthy food for you and your family simply foolproof. 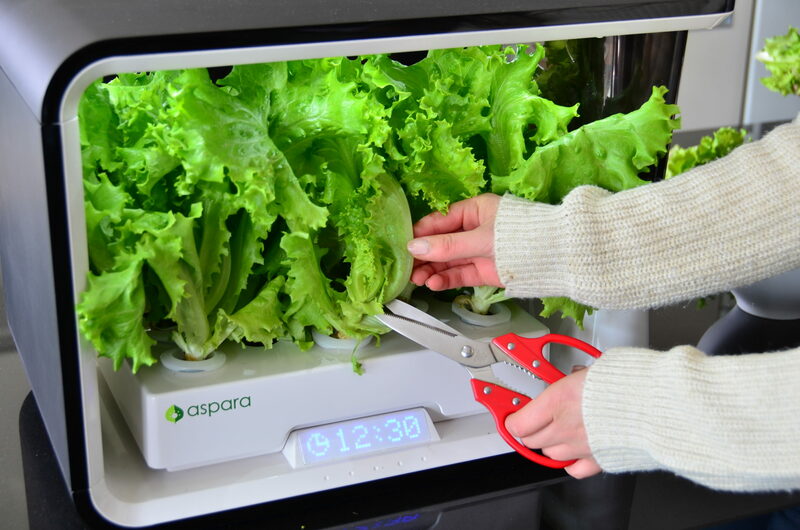 The aspara™ smart indoor grow box is a miniaturized hydroponics farm system. Hydroponics is a method of growing plants without soil by using mineral nutrient solutions in a water solvent. The hydroponic growing method cuts out the need for harmful chemicals and pesticides and it calls for only 10% of the water that would be used in typical farming methods. It also allows for full climate control and 25-30% faster growth. aspara™’s smart built-in sensors monitor, detect, report and record growth conditions based on nutrient concentration, air temperature, humidity, water temperature and overall water content in the system. The sensors adjust lighting, water flow and planting modes based on your plant’s needs. Precise monitoring of the growth conditions provides accurate instruction on the amount of water and nutrient required to be refilled into the system. The adjustable one-touch grow light provides a full spectrum of intensity that caters to the needs of different plants at different growth stages, as well as your personal preference. Control growth through specific programs and replicate nature with sunrise and sunset scenery. You can even adjust the lighting to “reading” or “photo” modes. The reservoir water system automatically waters your seeds and plants based on their nutrient levels and stage of life. The automatic ebb and flow design recycles the water so that nothing is wasted. 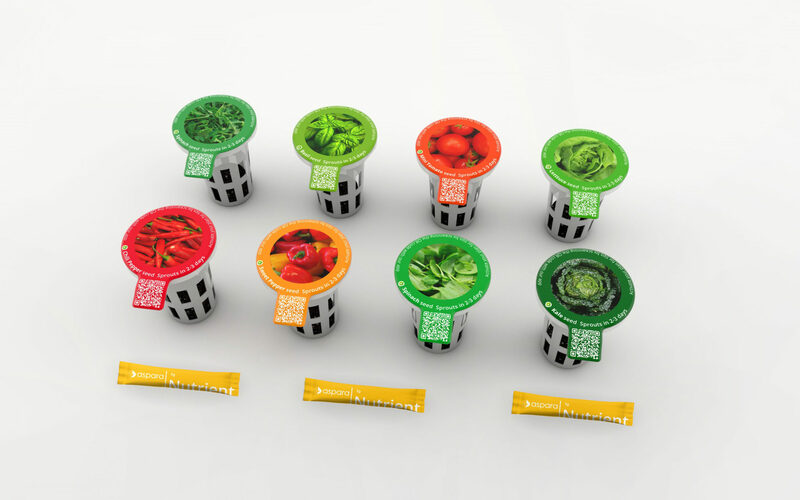 The aspara™ seed kits include 15+ different seed capsules and nutrients that guarantee a 100% germination rate by just plugging the capsules into the specialty grow tray. It’s that simple! Seed capsules include: green lettuce, mizuna, blue curled kale, red lettuce, butterhead lettuce, mixed lettuce, mixed baby leaf, arugula, sweet basil, coriander, dill, parsley, cherry tomato, red radish and pansy. The aspara™ IoT-connected app provides necessities, such as your plant’s light, water, temperature, and nutrient information, and it tracks your plant’s activities and conditions, but it does so much more… The aspara™ app is a community platform for support, as well as a space to share your plant’s growth with people who share a similar passion. You can even share your progress through photos and videos on social media! 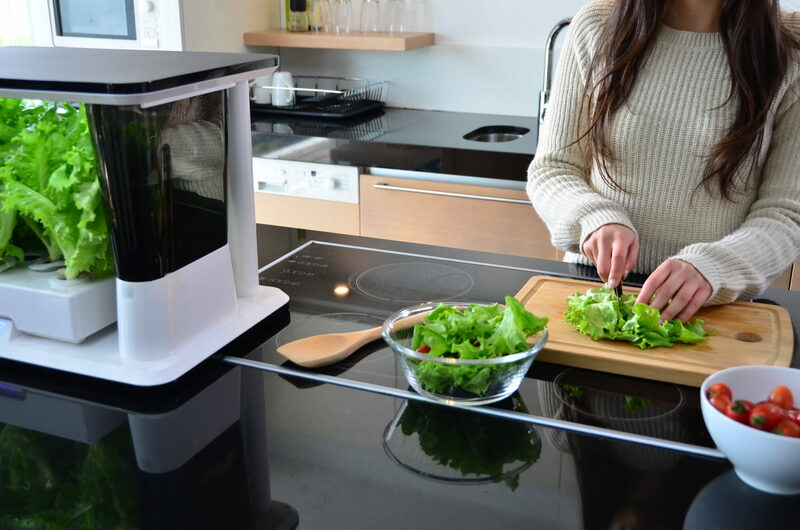 aspara™ makes togetherness as easy as it makes growing fresh, healthy meals.